Adam J. Decker has been serving the needs of harpsichord enthusiasts for over 20 years in the Southeast. He formed Early Keyboards of Atlanta out of a growing desire to share the sights and sounds of this wonderful instrument. Through constant interaction with universities, baroque ensembles, churches and individuals, he has enjoyed and maintained a steady clientele of both new and repeat customers. Whether your instrument needs a simple adjustment or complete technical rebuilding, he is able to meet whatever early keyboard need you may have. He has a very long list of satisfied customers that are eager to share their experiences with you. Please inquire. Dr. Decker is married and has a 9 year old son Mitchell James. 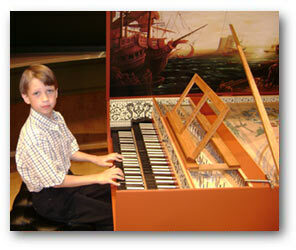 Mitchell has participated in formal keyboard studies since he was 4 years old. Mitchell cites Trevor Pinnock as a major influence in his short musical life. In 2009, Mitchell got the chance to meet his idol at Spivey Hall in Atlanta, GA. Aside from playing the harpsichord and pipe organ, he also performs technical tasks around the shop such as tuning, jack removal and playing in newly built instruments and rebuilds. He wants to be an inventor/scientist when he gets older in addition to building and maintaining harpsichords. The workshop resides 30 miles north of Atlanta in Dallas, GA. When not caring for patients and working with harpsichords, he enjoys university teaching as an infectious disease biologist, collecting antiquated human anatomy texts, publishing scientific articles and traveling to many areas around the country delivering harpsichords.